My little brother Matt bought a house last Friday. Today in the first of many such purchases, he bought a shop vac. It's the house my dad grew up in and Matt is the third member of the third generation of the Pesotski family to live there. 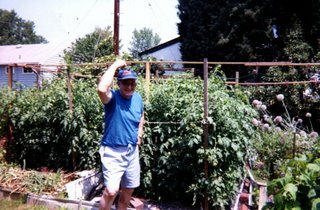 I lived ther for about a year after my grandfather (pictured above) died. My sister lived there for a few years and now Matt has lived there longer that he thought he would. These things seem daunting, but just do it. The textured wall paper will go up fairly easily. A fresh coat of paint on it and the kitchen will do wonders. It's cheaper than re-rocking the palce and WAY less disruptive. It's sale time at the nurseries. Get some new bushes and plantings in before winter. They will stay dorman and come in great in the spring. This, along with the new siding will do a lit to improve the curb appeal. Home ownership is a lot of fun and you learn a lot. Enjoy! i love that pic of grandpop. i have it up here too. Congrats on the house, if you need any help I can point and tell you to do things. I found making a list was really helpful in getting things done. Now, get to work you slumlord. You've been living there about 6 years and you still haven't painted the living room. this from the guy who wouldn't so much as cut the lawn when he lived there. plus, i was reeennntttingggg. and poor. i don't need to make a list, the delco guy already did it. So when are you getting started? You bought a shop vac three days ago and my guess is it's still in the box.